Vernon Transpiration was established in 1985 by John Aguilar with just one truck and only himself as the driver. John was a firm believer in that if you wanted to be good at something, then that has to be the only thing you do! That motto still runs true today as we are dedicated to hauling only sweeteners. With this type of dedication and roots in the sweetener industry dating back to the early 50’s, we have always set our standards to the absolute highest surpassing even the customers that we haul for. This has allowed Vernon Transportation to become known as the premier transporter of sweeteners nationwide and is the most requested carrier by all of the major sweetener suppliers and customers in the food and beverage industry. The key to any carrier who handles food grade sweeteners is a reliable, first class wash station. We possess that type of facility in Stockton Sanitary Wash Rack. We have set for ourselves the highest standards known for trailer sanitation requirements. Our standards are the highest and strictest in the industry. 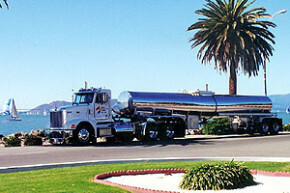 Only trailers that have hauled approved food-grade sweeteners are washed at this facility. The entire wash station is Kosher certified by the Orthodox Union. Our wash station samples and checks every aspect of the sweetener handling and trailer sanitation process. Many of our customers are using our state of the art, on-site laboratory as an independent, backup-testing site to their own; they know we have the equipment and the staff to ensure food safety all the way to you, the consumer.